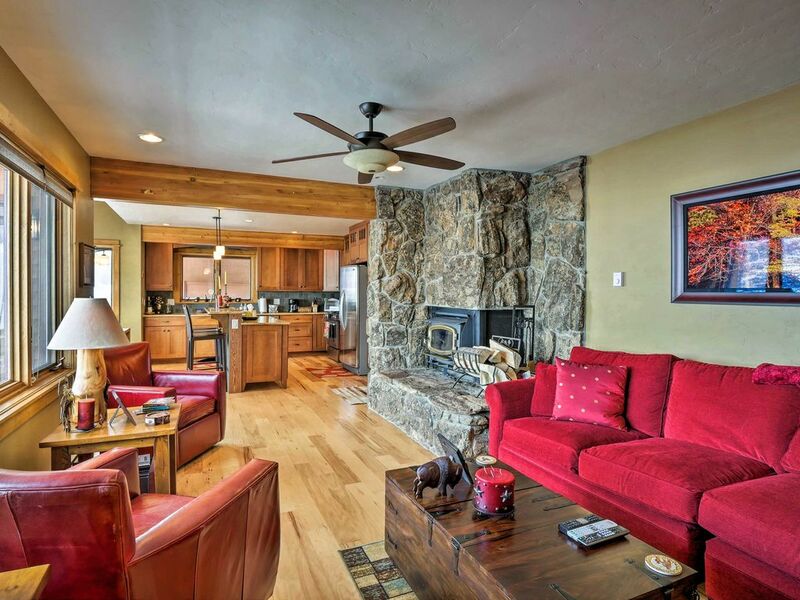 Fall in love with the beauty of Steamboat Springs in this luxurious 3-bedroom, 3.5-bathroom vacation rental cabin for 9. Sitting less than 10 minutes from Howelsen Hill ski area, Steamboat ski resort, and Old Town Hot Springs, this 2,500-square-foot home is the perfect getaway no matter the season! You'll also have access to a private deck and several hiking trails during your stay. Boasting exposed beams, a gorgeous stone fireplace, and a slew of high-end amenities, you're sure to be blown away by the luxurious lifestyle this cabin offers. After a day outdoors, retreat into the living room and melt into the couch. As you watch your Netflix favorites on the flat-screen Smart TV, you'll have breathtaking mountain views through the large windows. The fully equipped kitchen features expansive granite countertops, a large island, and stainless steel appliances, making it easy to whip up a 5-star feast for your friends. When eyes grow tired, 5 lucky guests will find comfortable sleeping accommodations in the large bunk room, complete with 2 bunk beds and a twin trundle bed. Just down the hall, the lavish master suite awaits. With a king bed, fireplace, flat-screen Smart TV, and balcony, the master bedroom is truly fit for royalty. Be sure to spend some time on the home's large deck during your stay. Overlooking the mountains, the deck is the perfect place to sip a glass of wine, throw burgers on the gas grill, and marvel at the beauty of the Rockies. Whether you're an Olympic hopeful or rookie rider, Steamboat offers a ski slope perfect for you! Less than 10 minutes from the cabin, the numerous trails and peaks of Howelsen Hill ski area and Steamboat ski resort await. No matter the season, the area's geothermal hot springs are a must visit. Sitting within 25 minutes of the home, the Old Town Hot Springs and Strawberry Park Hot Springs offer soothing soaking pools with a plethora of medicinal and recreational benefits. Lace up your hiking boots and explore the beautiful scenery around you. The Yampa River Core Trail, Fish Creek Falls, Medicine Bow-Routt National Forests, often called the 'Land of Many Uses,' and more offer challenging terrain just a short drive from the home. - Amenities include a fully equipped kitchen, 3 flat-screen Smart TVs, free WiFi, 3 fireplaces, a deck, balcony, gas grill, mountain views, stainless steel appliances, granite countertops, a bread maker, blender, 2 coffee makers, toaster oven, slow cooker, 3 plastic sleds, free WiFi, garage parking for 1 vehicle, driveway parking for 2 additional vehicles, complimentary tubes and rafts, and more! The house fit us perfectly and was very welcoming. It had all the amenities and a few unexpected touches — like games for the kids and a beautiful view of the mountain (including a perfect spot to watch the fireworks on the ski hill). The house is lovely and had everything we needed—we really enjoyed the wood stove and it was so pretty at night we didn’t even go out. With 3 teenagers in tow, I couldn’t have asked for a more perfect set up. The location was great, too. This home is very tastefully updated with a modern kitchen, tastefully furnished family room, bedrooms, and two nice bathrooms with large walk-in showers. Second floor Master bedroom is large with king bed, gas fireplace, master bath with two separate sinks and walk-in stone shower. Second upstairs BR has two double beds. We did not use that room and noted that there is no hall bath upstairs so users would have to share the master bath or use downstairs bathroom. Downstairs BR has a number of beds and bunk beds and has a full bathroom with walk-in shower. If two couples stayed here, one couple would probably use this room, since it has its own full bathroom, but it is set up more for overflow, not like the two upstairs BRs. But this room also has a fireplace, TV, etc. The kitchen is great, with nice Jenaire stove, big refrigerator, granite counter tops, and plenty of cookware. We love to cook and found everything available for that, including condiments that remained from owners or other guests. We grilled a couple of nights on the natural gas grill. It started right up and worked great. It is set up a bit distant from the house...fine in the summer but a bit challenging to walk back and forth from with the snow, and also had to walk up beside the house to turn the gas on and off. Overall, this home is bright, beautiful, comfortable, and has a view of Steamboat that probably very few homes in the area have. And there are loads of large windows and a full deck to enjoy the view!